GEORGE TOWN: A performing arts centre, a green shopping mall, marina, convention centre, and an IT hub to accommodtae MSC-status offices are among the key components of IJM Land Bhd’s RM4.3bil The Light Waterfront phase 2 project, located next to the Penang Bridge. IJM Land managing director Datuk Soam Heng Choon said this at a recent press conference to unveil the components of The Light Waterfront phase 2 project. The project’s construction work would start in 2012 when the ongoing exercise to reclaim 210 acres was completed, he added. So far, IJM Land has reclaimed 42 acres for phase 1 of The Light Waterfront scheme, comprising 1,177 condominium units and gated-landed residential properties, which has an estimated gross development value of RM1.2bil. “Out of the 210 acres, 152 acres are for the first, second and third phases of the project. “The remaining 58 acres are reserved for the group’s future projects. “It will take about 10 years to complete the second phase project from 2012,” he said. Soam said the performing arts centre would be housed in an iconic building, equipped with seating for 2,000 people. “There is a sea-fronting amphitheatre next to the performing arts centre. “The marina that we are planning will have about 250 berths for yachts to park. “There will be two four-star hotels, catering to the family and business markets, and a five-star business class hotel linked to a convention centre. “There will also be a 40-storey IT building to house MSC-status companies. The green mall, which will have about one million sq ft of lettable area, provides street shopping facilities and a green environment,” he said. 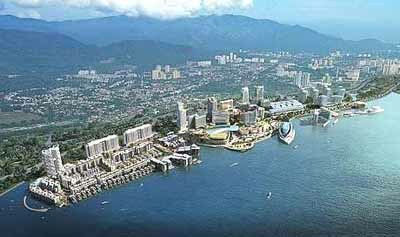 The entire Light Waterfront project has an estimated gross development value of RM5.5bil, comprising three phases. “The final and third phase is a seven-acre seafronting park,” he added. Soam said the group has sold over 60% of the 416 condominium units launched so far under phase 1. These properties were sold for between RM650,000 and RM1.8mil each, added Soam. “We will be launching more residential properties for The Light Waterfront phase 1 towards the end of the year and early 2011,” he said.